TerminalControl object is a Windows Forms terminal emulation control that makes it very simple to add SSH and telnet terminal emulation capabilities to your application. Tip: You can bind a terminal to a telnet session or to a Serial Port. How to do it please see Terminal Connecting page. TerminalControl shares most features with VirtualTerminal and they are described below. For an overview of features specific to the control, see Windows Forms Terminal Control page. Note: Still too complicated? Try a single-purpose SshTerminalControl or TelnetTerminalControl controls first. These can be configured by the Visual Studio designer and all you need to do to start an SSH or telnet session is to call the Connect method. Those controls are less flexible but easier to start with. Tip: TerminalControl has many useful configuration options. VirtualTerminal is a terminal emulation object that is very similar to TerminalControl, but there is one major difference - it's not visible. In fact, it's not even a control. Otherwise, it shares most features with TerminalControl and is suitable for applications that need to interact with SSH or telnet servers but don't need to display the actual terminal session. Tip: VirtualTerminal has many useful configuration options. Tip: If you are mostly interested in the scripting API, use Ssh.StartScripting instead of Ssh.StartVirtualTerminal. The returned Scripting object is still based on VirtualTerminal. ITerminal interface makes it possible to easily write code that targets both TerminalControl and VirtualTerminal objects. It includes Save and Bind methods. Properties such as Options, Screen and Scripting are available as well. Although VirtualTerminal does not have a visible screen, it's possible to attach a custom renderer with SetCustomScreen extension method. A custom renderer simply has to implement the IScreen interface. Both the method and interface are available in Rebex.TerminalEmulation.Interop namespace. 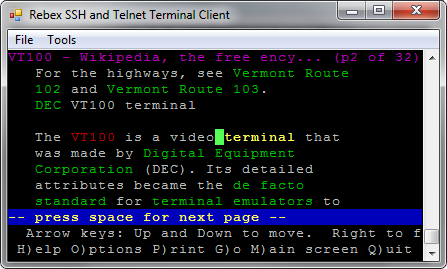 Both TerminalControl and VirtualTerminal provide access to their terminal screen through Screen property. It makes it possible to read and alter the screen content. Both TerminalControl and VirtualTerminal provide powerful scripting capabilities through provide access to their terminal screen through Scripting property. Tip: If the scripting API is all you need, simply get a VirtualTerminal-based scripting object by calling Ssh.StartScripting method. Terminal objects provide a 'history buffer', where the output that scrolled away from the current screen is persisted. The maximum size of the history buffer length is configurable. Use TerminalControl's HistoryMaxLength property to change the default value. VirtualTerminal doesn't use a history buffer by default, but it can be enabled by calling the appropriate constructor. Tip: Several aspects of TerminalControl's scrolling behavior are configurable. Note: We support xterm-style 256-color palettes. However, many terminals can only utilize the first 16 colors. Tip: For a list of color indices, check out the color schemes blog post. Tip: For a monochrome application, custom styles provide a nice visual enhancement - see the color schemes blogpost for details and a list of color indices. Note: Color schemes work with color-capable terminals as well. They even make it possible to turn a color terminal into a monochrome one simply by setting TerminalOption.ColorScheme property to ColorScheme.Monochrome. The font specified should be a monospace font whose characters are of constant width. Variable-width fonts are supported as well, but will most likely not look very good. Note: In addition to Windows fonts, ITerminal supports legacy raw DOS fonts. Use TerminalFont.FromDosFont method to load them. To ensure the best viewing experience, our terminal controls have built-in drawing routines for lots of special characters. You won't see any gaps in lines composed of various line-drawing characters. TerminalControl and VirtualTerminal classes provide many options to make them compatible with lots of different terminals. For more information, check out the documentation for the TerminalOptions class or the Windows Forms Terminal Client sample. It's possible to start a terminal by launching a remote command instead of a shell. When the command ends, the terminal session ends as well. This is very useful if you need to ensure that the remote command won't suddenly fail and get back to shell without notice.